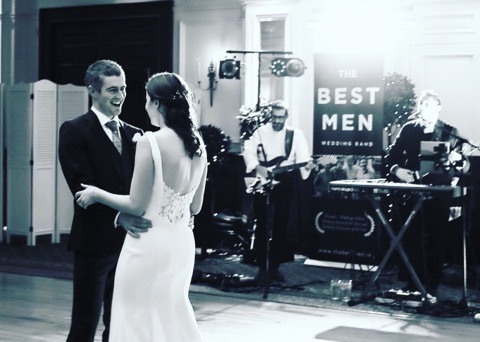 After performing at over 1,000 weddings, The Best Men Wedding Band Testimonials page is growing and your comments and feedback always make us feel all gooey inside! Below is just a snippet of your lovely words after the big day…. I didn’t get to thank the band in person or DJ last night at our wedding. They were absolutely brilliant and we all had so much fun dancing. Please pass on thanks. Positive feedback all round! I just wanted to email you and the guys to thank you so much for all your help over the past year. You were a pleasure to work with and made the whole booking process so simple. The band on the night arrived on time and absolutely smashed it. We are getting a lot of great feedback from our guests who loved them, some saying that they are the best band they have ever heard, so hopefully you’ll get a few more weddings out of it. The DJ was also fantastic. A seamless transition from the band to DJ really kept the dance floor going. I really hope to cross paths with the band again. Thank you again for all your help over the past year and for making our wedding day feel special. The Best Men played our wedding last Friday & i just wanted to email you to say thanks so much! You have no idea how well they went down!! I didn’t get a chance myself to talk to the band but if you could pass on our thanks to them. They were phenomenal, the dance floor was always full, we LOVED how they played our first dance! Such a good band, I’ve had future brides asking about them! Thanks to yourself too for all your help, weddings are full on but you were so easy to deal with. 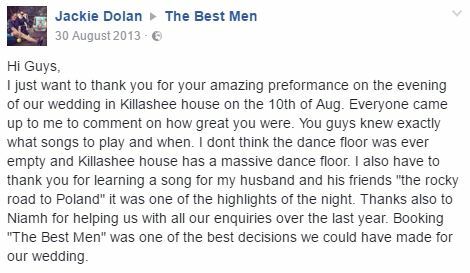 Hi guys, we just wanted to say a massive thank you for your amazing performance at our wedding in Clonabreany House on October 20th! The dance floor was buzzing all night, everyone was dancing from 6 year olds to 86 year olds. The guests are still raving about ye! We will without doubt be recommending you. Thanks again for your professionalism and wonderful entertainment. Just wondering can you pass the following message onto The Best Men. Just want to say a huge thank you for playing at our wedding on the 29th September. They were absolutely brilliant. The dance floor was never empty. The playlist was just perfect…it covered all age groups. Thanks again for making our day that little bit more special. We would also like to thank the DJ who played along side the saxophone player. I will definitely be recommending the guys to friends and family. On behalf of myself and Carmel, I would just like to thank the band for the amazing job they did on Saturday, the band have been receiving high praise from all our guests and they were just really nice guys to deal with. The floor was full all the time, they really entertained and made the wedding really special. Just want to say a massive thank you for being amazing at our wedding at the Newpark Hotel in April. The place was hopping all night and the dance floor was always packed. We did so much dancing it was brilliant. The whole experience was so professional, Thank you so much. We would highly recommend you to anyone!. We just wanted to thank The Best Men for being such a brilliant band. We were just thrilled, they had all the guests on the dance floor from the start. They really got everyone flying which was fantastic, will definitely be recommending them for any future weddings! “Massive thanks to the lads for been so brilliant at our wedding reception in the Carnegie Court Hotel, you were absolutely brilliant and have recommended you to so many people already with weddings coming up. We had the best night and cant thank you enough for being part of it and really kicking off our night!”. Joanna, you have been brilliant to work with over the last few months, being so helpful and friendly back and forth via email! Thank you so much for everything! To the lads, you were absolutely brilliant on the night of the wedding! Everything we wanted and more. So many people have commented on how amazing the band was! And of course to the DJ as well who played a whole load of 90s bangers!!! A huge thank you to all involved. I would highly recommend the Best Men to any other bride and groom! Thank you for an amazing night, everyone raved about the band and the DJ! I just wanted to say a huge thank you to you both and the band for our wedding entertainment. They were just fantastic and we have had lots of great feedback. The play list throughout the whole day was great and I am sure you will agree that the floor was pretty packed throughout the whole evening. Thanks for playing at our wedding in Castleknock in November. The music was brilliant and the dancefloor full all night. People were raving about you the next day! Marc + Ann x. We wanted to drop an email to say a huge thank you to the band for performing at our wedding last Friday night! They were absolutely brilliant and all our guests had a fantastic time dancing the night away. Myself and Andrew just wanted to send a short note to thank The Best Men for their fantastic performance last Friday at our wedding. Our first dance was The One by Kodaline and it was amazing. We apologise as we didn’t get to thank them in person on the night – it was so hectic! They were absolutely fantastic and our guests really enjoyed the music! We got a lot of compliments on the band choice and the dance floor was full all night. The DJ was also excellent and a very nice man. Please let them know that we had a great evening and we really appreciate their great work! If they would like us to post a review somewhere we would be more than happy to do so. The Best Men were featured in Jacqueline & Marc’s wedding: Australia to Ireland in September 2017. 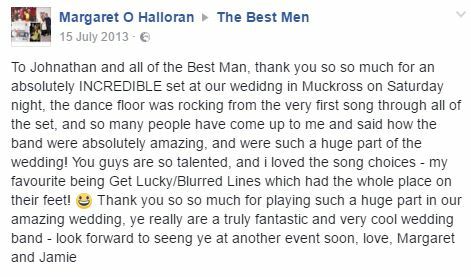 “We had The Best Men play at our wedding reception in Dunboyne Castle on the 14th July 2017. Well what can we say they were AMAZING!!! They were so professional from the moment of contact with Niamh in the office to our last dance. The floor was full all night. Their music had something for everyone and were very popular with all our guests. You can really tell that they love what they do and it really comes through in their music”. Amy & Tom, 14th July 2017 (spotted on Facebook). We are just back from our mini honeymoon and we wanted to e-mail and say how much we enjoyed last Friday. Could you please thank both the band and the DJ for us, as both did an amazing job, kept the dancefloor going for the whole night and everyone commented on the great musical choices. Both were a pleasure to have on our day. The band were fantastic the dance floor was jammed from the very first tune! Thank you so much for singing on Saturday!!! You were absolutely stunning!!! Your voices are just fantastic!!!!! We thoroughly enjoyed it as did our guests. I’ve been asked numerous times for your details! We initially saw the guys when they played my sister’s wedding 4 years ago. When it came to our turn there was absolutely no doubt as to who we were booking! The Best Men are sensational!! The dance floor was full all night. Everyone has commented on the variety of music and the professionalism of the guys. We just want to say a MASSIVE thank you thank you thank you to the guys! You made our reception. Couldn’t have done it without you! And the ladies in the office, such ease of booking and organisation – Niamh and Joanna – thank you to you both too Don’t hesitate – Just book these guys – You WILL NOT be disappointed!!! Just a quick note to say thank you for everything on Thursday. From The Kooky Ukes, to The Best Men to the DJ, there has been nothing but positive feedback! The atmosphere and your professionalism blew us away and made our day that much more special. You can be sure we’ll sing your praises whenever the opportunity arises and hopefully get to see ye again in the future. The band were absolutely fantastic – the video clips on line really don’t do them enough justice. i have never seen a wedding where the dance floor was rammed for the whole time they played. Hi guys just wanted to say a big thank you for playing at our wedding on Thursday!!!!! You were great and had the whole floor packed for the whole night!!!! We couldn’t have picked a better band!!!!! WELL WORTH IT!!! These guys are great. were very quick to set up and the dancefloor was packed from start to finish!! they played what we wanted and more and are very professional. I would recommend this band to anyone who was unsure of who to get. Great night!! We just want to thank the band for an absolutely fantastic night last Saturday. From the moment the band started to when the dj finished the dance floor was packed!!! I thought all of our mum and dads friends would be gone to bed at 12 o clock but they were still dancing at 2.30!!! The speeches and entertainment went on longer than we expected and the band were so accommodating and even played on longer than they were meant to, we really really appreciate this and it meant so much to us as everyone was enjoying themselves so much. Well, if we could give more than 5 stars we would! Having the best men at our wedding really just made it perfect. Everyone raved about the music for the whole night. They had the dancefloor packed at all times. They were also very good at reading the crowd, there wasn’t one song that didn’t have everyone running to the floor! Adding the brass section really made them that little bit extra special. Also the DJ supplied was excellent and made the transition from band to DJ seamless. We would absolutely recommend them to anyone. Worth every penny! Myself and Ronan want to say a big thank you to the guys for Friday. Everything from the church to the DJ it was all fantastic. The guys were excellent, everyone is saying how good the band were and we are delighted. Please pass this onto them as we would like to say a big thank you to them. Just wanted to thank the band and DJ for playing at our wedding on 14/03/15, just trying to get back into the swing of things now…honeymoon is well and truly over unfortunately. We had an amazing day and the music was the icing on the cake…everyone commented on how good the band was and how the band ‘fitted’ into all the genres of music played. Would also like to make a special mention to the DJ who was very accommodating with requests, karaoke and dance-offs…it was a fine finish to the evening…please pass on our comments and good wishes. Thanks again for everything…and will pass your name around when we can!! Hope you’re well! 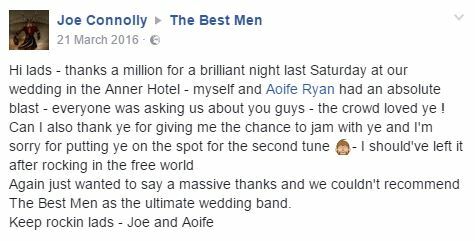 A very quick note from us to pass on our thanks again to the lads in the Best Men for playing our wedding on Saturday. The lads were great and the dancefloor was full all night! The poor DJ had an awful act to follow!! Honestly couldn’t have been happier with how it went & delighted with our choice of band. Lots of compliments from our guests too! Thanks again! They are a brilliant band, great sound, work well with their audience and really know how to get the crowd going. They paid attention to our requests and met all expectations. The reception music by the Kooky Ukes was awesome and everyone really enjoyed the atmosphere. Firstly I just want to say a special thanks to you for making life so simple and been so professional in every dealing I had with you by phone or e-mail. We would like you to pass on our sincere thanks to the band who were brilliant and we were really happy with them and people had only great things to say about them after the wedding. Also the DJ was top notch as well and the transition between the 2 was seemless. Thanks again and the very best in the future to you & the guys. 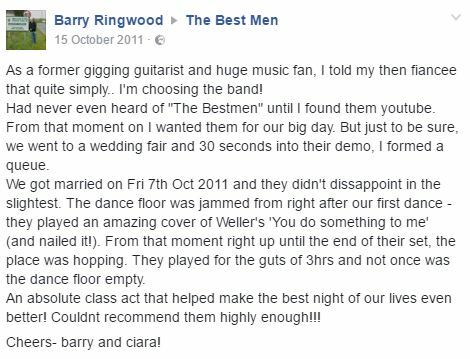 The Best Men band were a pleasure to deal with from start to finish. So professional & on our big day had the dance floor full from the beginning. 100% recommend. Our friends also booked them after hearing them at our wedding. What a weekend we have had! Just a very quick note to say a huge thank you to the band and dj. Everyone is still talking about how good they were, don’t think we left the dance floor all night. We are dashing off on honeymoon now but just wanted to make contact before we go. We just wanted to drop you and the band a quick note to say thanks very much for performing at our wedding. They were absolutely first class. I think a practically full dance floor told its own story. And also thanks to the DJ for putting up with our bizarre(PJ and Duncan) requests!! A couple of our friends have already asked for your contact details which have passed on. Hi Niamh, I just wanted to say a MASSIVE thank you to The Best Men and the DJ for playing at our wedding on the 12th April in The Millhouse. The band were incredible, we had so much fun dancing and our guests are still talking about how brilliant they were! We’ve had lots of people say that they kept forgetting that there was a live band playing because the music was so amazing that it sounded like it was recorded in a studio. Everything they played was perfect and really fitted the crowd at the wedding. Also, the dj set was perfect and we honestly couldn’t have asked for better|! Thank you all so much for everything. I would highly recommended the band and dj to absolutely anyone, they were perfect! Anthony and Karen here we just want to say a huge thanks to you for all your help over the last few weeks. As for the band they were just amazing from the minute they started to the finish. Jonathan is an amazing vocalist. The dance floor was never empty. The biggest compliment we can give them is that numerous people said to us that they didn’t even know the DJ had started. I am a hundred per cent sure ye will have numerous enquiries from people in west cork with regards the best men. Everyone was blown away. Also thanks for playing on so long I know ye didn’t need to. Also the dj brought the house down. So in all we can’t say enough good about the whole experience. Just amazing. I hope they enjoyed the Rosscarbery clientel. Just dropping you a quick note to say thanks, to you for being such a pleasure to deal with and for the guys for putting in a great performance on the night! They had everyone out and the dance floor was filled for the night, which is all we could ask for. They were asked for a few cards on the night too so hope it leads to a few more gigs for them! Hope you had a good New Years and thanks again! We are just back from honeymoon and wanted to send a huge thank you to Jonathan and The Best Men Wedding Band for the amazing job they did.Everyone has been raving about The Kooky Ukes, so many people have been asking about them and commenting on the atmosphere they provided and the fun music. One of the managers in the hotel was even asking about them and said they were the best reception music he had ever seen there.</p> <p>The Best Men Wedding Band did such an amazing job and we are hearing such great feedback from all our guests. They had everyone up dancing all night long. Thanks for all your emails over the past few months and for being so easy to deal with. Hello Niamh, We are just back this week after a lovely honeymoon, and I just wanted to thank you and the Best Men Wedding Band for the wonderful job you did for us. The dancefloor was full all night, and every single person at the wedding was on it at some point, if not all night. They were truly brilliant and we were blown away, everyone loved them, the dj ws brilliant also at keeping the party going. Thanks for fitting in the songs that I requested, it was great and meant a lot – we’ll have no hesitation passing on your details to anyone in future, and would be delighted to do so!! Rich was wondering if the band had any idea of some of the songs that they played, or a play list still hanging around, he loved them so much, he wanted to have like a little playlist of our wedding party to have a homecoming celebration to. My (now) husband and I booked the Best Men Wedding Band for our wedding in the Brooklodge Hotel in May 2013. From the moment of our first inquiry Niamh had been an absolute joy to deal with, everything ran so smoothly. Niamh was very helpful and made the whole booking process so easy. In deciding between our favourite bands we went to see each band play a few times. Niamh was great in giving us all the details of any upcoming events that the Best Men Wedding Band would be playing at so we had no problem finding the time to go see them. After the 2nd viewing we realised we’d seen the best and we went ahead and booked the band. 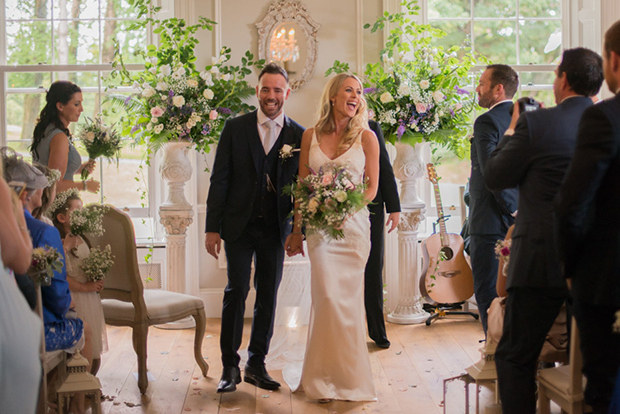 The band themselves were so easy to deal with and they had no problem playing us a special song for our first dance – we were absolutely delighted they were able to play this for us. This was a song not on their repertoire list – we wanted a particular song but arranged differently to the original. We were expecting to be told that it couldn’t or wouldn’t be done but it was no problem. The song on the day was perfect, we were so happy. From the first dance until the band finished – they were amazing. Everyone at the wedding really enjoyed the music and thought the band were great. We also booked the Saxophonist to play with the band -we weren’t disappointed – he was brilliant. So if you’re booking a band for an event, or even better – a wedding, check out the Best Men Wedding Band – you won’t be disappointed. 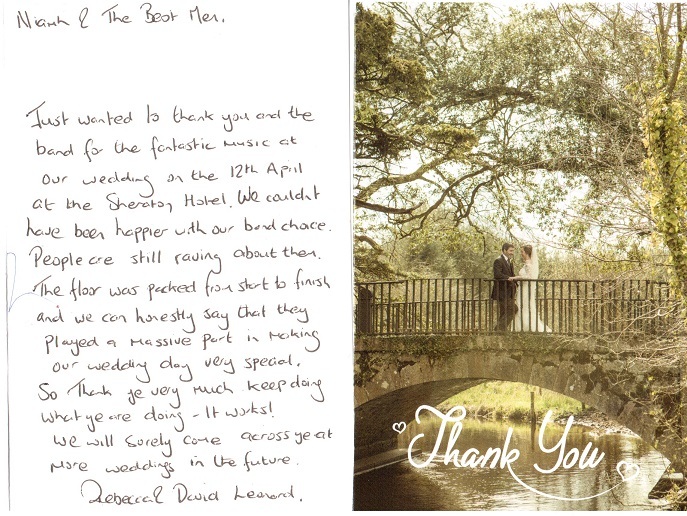 Thank you so much to the best men who played at our wedding on the 10th of may. Absolutely brilliant band, the dance floor was full all night and everyone commented on how great the band were! Thanks guys!!! Would recommend you to everyone. Hello Niamh, Both myself and Marion want to say a massive “Thank You” to both yourself and the lads for a great night at our Wedding on the 13/4/13 in Trim Castle Hotel.The Lads were simply “Outstanding” with the dance floor packed from the very first song, to the last, so much so we didn’t want them to finish at all. Their set was non stop with a great genre/mix of music. All of our guests raved about how great they were on the night and in the days and weeks following our Wedding. In fact a lot of our guests felt like they had ran the marathon the next day they had danced that much ! The lads were brilliant and we cannot put into words exactly how great they were. We knew they would be good but they simply surpassed our expectations and made our Wedding night one to remember for all the right reasons. We would strongly advise all potential Brides & Grooms to book The Best Men Wedding Band ASAP and do not look anywhere else!! If anyone is ever looking for a reference as to how great they are please feel free to pass on my number. Thanks very much for helping to make our day as special as it was. Thank you so much for a wonderful night. Ye were fantastic. We danced all night long and the time the DJ came on we were truly wrecked! We never left the dance floor. Everyone thought you were fantastic and when we needed a rest, you played a song even better than the last and we had to dance on. No chance to recover at all! I wish you all the best in the future. Thanks for all the brilliant memories. You really have the best job – always making people happy. Just wanted to thank you and the band for the fantastic music at our wedding on the 12th April at the Sheraton Hotel. We couldn’t have been happier with our band choice. People are still raving about them. The floor was packed from start to finish and we can honestly say that they played a massive part in making our wedding day very special. So thank ye very much, keep doing what ye are doing – it works! We will surely come across ye at more weddings in the future. Just wanted to send you a quick email before we went on honeymoon to say how brilliant the lads were on Saturday. The dance floor was never empty and everyone commented on how brilliant they were. We’re part of a musical society that put on a panto every year and just about every song was covered on the night, everyone thought we had pre-arranged some of the medleys with the band!!! A lot of very well dressed wedding guests dancing to their version of “Gangnam Style” will go down as one of the odder but brilliant memories of the day!! Thanks for being one of the highlights of our day! We just wanted to send you a huge thank you from both of us for all your help with our Wedding music on 13th September at Carton House. Your prompt and kind emails were much appreciated and the band were fantastic, setting up and playing without any hassle. So many people commented on the excellent band which really helps makes a Wedding. Please thank the lads for us, we will be recommending the Best Men Wedding Band to anyone we can. The Best Men Wedding Band played at our wedding reception in the Anner Hotel in Thurles on 31 August 2012. I just wanted to let you know how happy we were with the band and the DJ on the night. They were amazing! Everyone thought they were the best band they had heard at a wedding in a long time! The dance floor was full from the minute the first dance was finished! It was so good. We had such a great night and a lot of that was owed to the amazing music played by both the band and the DJ. If you could pass our thanks on to the guys we would be very grateful. Everything ran so smoothly from the moment we booked with you right up to and on on the night! I will definitely be recommending the Best Men Wedding Band! Just a quick note to thank you for being a huge part of the best day of our lives. WHAT A BAND?!!!! And I will be and have passed on your details to lots of people. Thanks again. Thanks so much for the huge roll you played on our special day. We just wanted to drop you and the members of the band to say thank you for all your help and the wonderful music on our amazing day in Carton House. In particular we want to say a special thank you to Jonathan. He was fantastic on the day. Niamh, Jonathan and the rest of the band. On behalf of my husband, our guests and myself, we would like to say thank you so much for agreeing to play at our wedding. The guests were talking about the music for weeks after. Between the arrival reception which was so peaceful and entertaining to the full on show ye performed later on in the night. We are not big dancers and knew for the guests to get out on the floor we needed to be too. The thought kinda sacred me but without even thinking about it we never left the floor all night. Thank you for that. Ye played the perfect music for the crowd. From what i heard, plenty of lads went for showers during the interval only to need another before bed. We can truly say we will recommend ye to others. Just wanted to drop a line to say thanks a million to the band for a great night on July 21st in Glasson Hotel & Golf Club. The band were brilliant and everyone had a great night. We kept meaning to take a break and leave the floor for a while but the music kept us there the whole night. A brilliant end to a great day!! Just wanted to drop you a note to say thanks to the band for such a great performance last Friday night. The music was brilliant, the dance floor was full all night long ( to my big relief!!). The guys were amazing! Everybody raved about them, I’m sure you’ll be asked to do a few more weddings in Wexford!! And I’d like to thank you to. You were so pleasant to deal with the band are really lucky to have you. Niamh I really just wanted to say an unbelievably huge thank you for absolutely everything you did for us, from beginning to end, your service was absolutely flawless and I really cannot recommend you highly enough. Nothing was ever too much trouble and I honestly really appreciated all of your help and advice. As for the music, well that was just amazing! Can you please please please tell Margot she has the most amazing voice – I know she has probably done tons of weddings over the summer but if she does remember ours, can you please tell her that everyone is still talking about how fantastic she was and that is not forgetting Jonathan! My one and only regret was not getting to speak to him and the band on the day itself to thank them – they were even better than I could have imagined, honestly the dance floor was packed from the minute they started, seriously the manager of Ballymagarvey told me the next day it was a long time since they had a wedding as lively!!! Anyway, I have no doubt that you are inundated with bookings and ongoing weddings as the year continues to fly by but I just wanted to say thank you and I honestly cannot tell you what a vital role the music played in making our day perfect, I know that sounds completely pathetic but it really is true! Just wanted to drop you a quick email before we head on honeymoon to say a huge thank you for the fantastic music at our wedding on Friday. The jazz duo and band were absolutely fantastic, everyone was asking us who the guys were and complimenting us on how brilliant they were. The DJ was also brilliant. The dance floor was full all night, apart from about 3 minutes when everyone was still stuffed after the evening food!! What can say? The Best Men Wedding Band were a real touch of class at our wedding reception. They had everyone out on the floor from the first song, a real sign of a good band. We have been inundated with rave reviews from guests who were so impressed by the music on the night. A big thanks to you and the lads (and the excellent DJ) from myself & Susan. We will definitely recommend ‘The Best Men Wedding Band’ to anyone looking to book a wedding band in the future. Just wanted to mail you and say a big, big thank you for the band! They were amazing! Everyone commented on how good they were. I will highly recommend The Best Men Wedding Band to anyone and everyone. Wishing you all the best with your business. Again thanks for making our wedding so special! Better late than never, just a quick email to pass on our sincerest thank you to the boys. We only received our wedding video the weekend just gone. The band were fantastic. We had the pleasure of being entertained by them again on easter monday just gone at Castle Durrow, fantastic, really really delighted we booked them, couldn’t have asked for better, the best in the business! Thank you so much for being part of our wedding – we danced all night and so many of the guests commented on how great the pianist, band and DJ were. You made our night! Thank you Niamh for dealing with our random queries in the run up to the big day. Just back off Honeymoon and back to work today so totally depressed……..
Just want to take this opportunity to thank you for all the help in arranging the music for our Wedding Day. We didn’t get a chance to speak to the guys much on the day, but all we can say is they were fantastic. Our Friends and Family are raving about how good they were, full Dance Floor all night speaks for itself I think. We will certainly be recommending The Best Men Wedding Band to all Friends in the future. Please pass our thanks and appreciation on to the band for playing at our wedding in the Kilkenny Ormonde. The Jazz Duo for the drinks reception were great, not too loud to allow for conversation yet atmospheric. The 4-piece band for the after-dinner reception were fantastic and the dance floor was never empty! Our guests had a great time and were talking about them for days afterwards. From the moment we booked The Best Men Wedding Band up until the Big Day, any dealings we had with yourself were stress and hassle-free. As a former gigging guitarist and huge music fan, I told my then fiancee that quite simply.. I’m choosing the band! The first time I saw The Best Men Wedding Band on youtube, I wanted them. We went to a wedding fair and 30 seconds into their demo, I formed a queue. They didn’t dissappoint in the slightest. The floor was jammed right from the first dance – an amazing cover of Weller’s ‘You do something to me’, rite til the end of their set. An absolute class act that helped make the best night of our lives even better! Cheers! Sorry took so long to email but just wanted to say how much we loved The Best Men Wedding Band!! They have brilliant voices and were fantastic from start to finish. I’d get married all over again just to have them play again for me!!! Fantastic, brilliant and superb musicians!! I am back to reality after an amazing wedding and honeymoon. Just wanted to drop you a quick note to say thanks for all of your help and also to ask you to pass on my huge appreciate to the band for the fantastic entertainment. Everyone was commenting to me about the band and they had just the right mix of younger and older music and I didn’t get off the floor all night and was just really happy with the band and the songs, they really are excellent! So if you could pass that on to the boys, I’d really appreciate it and again thanks to you for all your help and kind words, it’s been lovely dealing with you. Just a quick email to say that the band were absolutely amazing! I have nothing but praise for them. Everybody commented on how good they were, the floor was full from the 1st song until the DJ finished. I have passed on the details to a number of people getting married next year and after. Will you please pass on my thanks to the band and tell them they were just fantastic and I will never forget the song they sang for our first dance, it was better than the original. I just wanted to drop you a note to thank both you and the band for the performance at our wedding on Friday 3rd June at Dunboyne Castle. The band were really fantastic on the night and catered for everyone’s taste in music. The following day everyone was commenting on how good they were and how much they enjoyed the night. The dance floor was never empty on the night which really is a good sign. I also wanted to thank you for allowing my sister to sing on the night. Obviously we knew about the 1st song but the second song was a great surprise to us both. If you could also pass on our thanks to the DJ on the night. He was really fantastic also and helped to make sure the party kept going as long as possible. Thanks again to you all and I will be sure to recommend the band to any of my friends getting married in the future. I’d just like to say a huge thanks to you and The Best Men Wedding Band band for making our wedding amazing. They were the best band I’ve ever seen and everyone loved them. We were all on the dancefloor all night. I’ve received brilliant feedback from all the guests. I want to pass on my thanks to you and the band and DJ for ensuring our wedding was swinging all day and night! Firstly, my thanks to you Niamh, you were the height of professionalism and gave me great confidence that I was dealing with a reputable outfit. On the day, the band were fabulous. The Jazz duo in the afternoon, set just the right tone – fantastic music played at just the right level, it really set the mood. Then the band in the evening were just great, keeping everyone dancing till the early hours. I was particularly impressed that despite, thanks to very long speeches, the band’s start being delayed by about 45 mins, the band played straight through to their finish time not taking a break. This meant we didn’t lose out on much of the band’s playing time and kept the atmosphere going – brilliant! The DJ was also fab! He played all my requested songs and the exact type of music I asked for, a brilliant end to a wonderful day. So thank you Niamh – it was all fabulous! Just wanted to get in touch to express our thanks to yourself for the ease in which sorting our entertainment has been handled and for the band and the DJ for providing such a wonderful entertainment at our wedding. It really was amazing, the dance floor was packed all night and we are still getting compliments on how great the band and DJ were on the night, we have watched back the wedding video and can honestly say the band sound fantastic. I’ve been recommending the band to everyone and have had people call me for their details so hopefully you’ll get some future bookings. Thanks again for all your help and making it all so easy from start to finish. John and I would like to say many thanks to you and the band for all the help prior to and on the night of our wedding. They were really wonderful. Thanks to the lads for making it a great party. We would like to thank you for all your help with the arrangements. 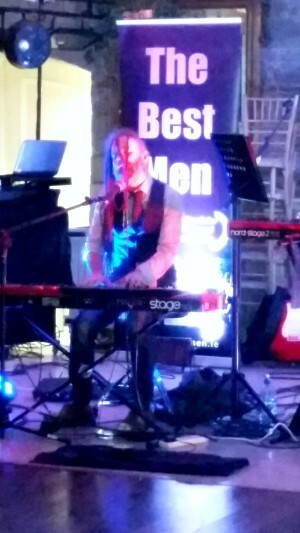 We would also like to thank the Best Men Wedding Band, the pianist and DJ for the great job they did on the night. The pianist played a lovely selection of music for the drinks reception and the Best Men Wedding Band were absolutely fantastic as was the DJ. They really made the whole night go with a swing. Thank you also Niamh for getting back to us so promptly every time we had a query. I wanted to send a note of thanks to you and the Band. I couldn’t even list the amount of compliments we had about the guys. They were unbelievably brilliant and I danced the night away. They were incredible. Myself and Kev didn’t even get a chance to talk to them. We are literally just back from honeymoon and I wanted to email you. I’m still getting text messages and emails telling me how amazing the band was! My mam was outside talking to some elderly relatives and she said all she wanted to do was get back in dancing coz they were so fantastic!! On behalf of myself and Kev thank you for making our day just soo brilliant!! I just wanted to say thanks to the band for such a great night and great music on 25th Feb in the Royal Marine. A lot of people complimented them at the time and since then – the floor was full all night which was what we wanted. Thanks to you also for all your help – you were a pleasure to deal with. We’ll definitely recommend The Best Men Wedding Band to any prospective customers! Back in work today after a fantastic month off. Myself and Aine would like to thank you and the guys for a fantastic night. Everybody we have spoken to are raving about how great the band was! Just a quick note to say thank you to you and the guys for giving us a great night at our wedding on Jan 10th. We will defiantly be recommending them to others and everybody at the wedding thoroughly enjoyed the music. We just wanted to thank you and the band for a great night. The amount of compliments we got on your behalf was amazing! 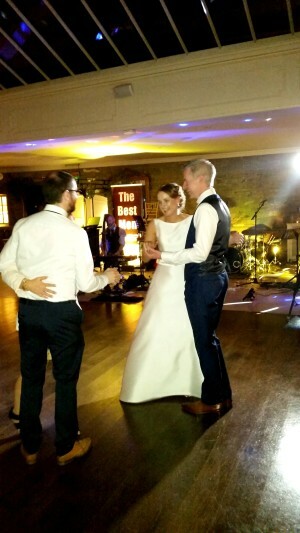 We were really happy with everything….the ease with which they went about setting up, their version of our 1st dance and most importantly, the choice of music for the night! It really set the tone for a great night! I just wanted to say that we were thrilled to have the Best Men Wedding Band for our wedding on 28 October. They were absolutely brilliant and we had a really great time. Also thank you for the wonderful version of time after time on such short notice! All the guests were very impressed by the band and we will certainly recommend you to any one who is getting married. Hope are all keeping well and our very best wishes to you for Christmas! Just a quick note to say a big Thank You to the Best Men Wedding Band for Saturday. They were excellent and the Guests have been raving about them since the wedding. And Thank You for organising everything for us. We just wanted to express our sincerest thanks and gratitude. The guys were fantastic. We meet them before they went on and the DJ which was great. Thank you so much for organising the music for the first dance and the guys were great, cutting it off at just the right moment- when our dance ended. Everything was seamless and everyone commented on how good they were! They had people up dancing that have never been seen dancing before and may never been again! Anyway thank you again so so much for all your help, you were so professional and helpful and I’d have no problem ever recommending you all to who ever you’d like! Just a quick email to thank yourself and the band for making our wedding day so special. Their set list is brilliant, very well put together and i honestly don’t think i left the floor all night and i never seen the floor empty once either, which is what you want on your wedding day. They are such an amazing band and i would have no problem recommending them to my family and friends. Just wanted to drop you a mail to thank you and the lads for an absolutely brilliant night – people are still raving about them. Thanks for all your help in the run up to the day, you made the organisation really easy for us. A MASSIVE thank you to the lads they were outstanding!! They even got my aunts and uncles up dancing and they never get up, the sign of a brilliant band. We both really enjoyed them and Jonathan was brilliant, all our favourite stuff – we danced the night away. Thanks a million again – we will recommend you guys to anyone we know tying the knot from now on! What can I say. Fabulous! They renewed my faith in wedding bands ;0) I would highly recommend them. Thanks so much. We just wanted to send a letter saying thank you for the wonderful job and great entertainment had by all from The Best Men Wedding Band. I would have to say that out of everyone we worked with for the occasion, working with you was the easiest experience as you had everything in order and all set from the start. Everyone absolutely loved the jazz duo at the outdoor reception as it really set the mood, and again, everyone was seriously impressed by The Best Men Wedding Band at the dance later in the evening. The DJ was brilliant and all knew exactly what to play to please all of our guests, both Irish and American, and of all ages. Every single guest danced and had a fabulous time as did myself and Mike. It was perfection and we would recommend them with much praise to anyone looking for entertainment in the future. Absolutely brilliant. Just wanted to say a big thank you to you and the band. You have been so helpful from the moment we first contacted you. It made life so much easier to know we could depend on you to help us with our requests. The band were absolutely brilliant on the night and kept everyone up on the dancefloor (myself included!). We had a brilliant day and your contribution made it all even more fantastic. Just wanted to say thanks so much to you and the band for everything you both did in relation to our wedding on 26 June. The band were absolutely brilliant and had everyone up dancing all night. Jonathan did a great job as DJ too. You personally were just amazingly efficient and organised – definitely the best person we had to deal with during the whole wedding planning stage! Just want to say a huge thank you to firstly you for help with arranging the Best Men Wedding Band to play at our wedding. You were a pleasure to deal with and everything ran so smoothly. Also thanks a million to all the guys in the Band for a brilliant evening. They were certainly very patient as the speeches and dinner ran over time (by quite a bit!). The best testament was that the dance floor was never empty and the lads catered for all ages in their choice of songs. All our friends and family are still telling us how great the Band was and how much they enjoyed the dance floor. I just wanted to thank you and the band so much for playing at our wedding on the 11th June last in Trim Castle Hotel. We got so many comments on how excellent the band was. The music was brilliant and the dancefloor wasn’t empty from the first dance until the last song of the night. Tell the lads thanks for letting our friends and family play a few songs. I had no idea that was going to happen or I would have let them know beforehand! Just wanted to say a big thank you for all your help over the last few months!We both had a really great day, and the band did you proud!! We’ll make sure to recommend if asked! A number of people commented on how good they were, on the great blend they did and their professionalism! I just wanted to say a huge thank you to you and all the lads in The Best Men Wedding Band for their performance on our wedding day on the 29th May. We had an absolutely fantastic day and night and it was largely attributed to the brilliant music they gave us. All our guests were absolutely raving about the music and some didn’t even notice that it had changed from the band to the DJ it was all so effortless with them! We also really appreciated the service you provided where we didn’t have to worry about a thing coming up to the wedding. It’s so great that you contact us in the lead-up to remind us rather than the other way around with most suppliers! Please pass our thanks on to all the lads and let them know we had a fantastic night with them all. Just a short email to thank you and the Best Men Wedding Band for you work at our wedding. The band were excellent and the sentiment was felt and commented by our guests. The DJ was also excellent and played a quality set list. We have only arrived home from our honeymoon and we just wanted to let the guys know that the music on the day was super and that we are really sorry that we never got a chance to talk to them. All the guests thought they were great. Please can you pass on our thanks to the guys for us, and thank you for arranging it all for us. We just got back from honeymoon and I just wanted to say thank you very much to the band for playing at our wedding. They were absolutely wonderful and everyone was saying how great they are. I think its always difficult when the dance floor and bar are split as in Marlfield House, but they did a brillant job of getting everyone dancing. I just wanted to say a Huge Thank You!!! The Band really provided such excellent service and top quality entertainment, I don’t think I left the dancefloor all night long, The guys were simply fantastic, young and old are still singing there praises and rightly so. I just wanted to drop a quick line to say thank you so much to The Best Men Wedding Band for playing at our wedding on 22/12/09. they were absolutely amazing and everyone was full of praise for them! floor was full all night, which is exactly why we hired them. Thank you so much for doing such a great job on our wedding night. The music was fantastic and it was great to see the dancefloor so full the whole night! Just wanted to drop you a line to say that the band were just amazing at our wedding in Castle Durrow on the 12th Dec. We didn’t get a chance to thank them at the time but if you could pass on our thanks that would be great. I can’t count the number of people who have said how much they liked the band too, they really got the party going and it was a great mix of tunes for young, old and in-betweeners! The Jazz Duo were were great as well and really helped set the mood for the drinks reception. Thanks also to yourself for dealing with our many questions and making everything so easy! Just a quick word to say thank you to Jonathan and the boys for their brilliant entertainment on the 21st November in the Athlone Springs. People both young and old have come back telling us how much they enjoyed the music and the dancing. The floor was kept busy all night long and their version of I Gotta Feelin in particular has become the anthem of the night. The guys looked brilliant on stage as well and they really really got us in the mood to party! Also thanks to Jonathan for learning Jack L’s version of Can’t Get You Out of My Head, no other band would have done that for us. It was a pleasure dealing with you from the outset and we hope to see you playing at friends weddings in the coming years. Just wanted to take a moment to send a huge thank you on to the guys. They played our wedding in October (only getting round to thank yous now!) and they were amazing. Everybody was raving about them! They played a brilliant set and had the dancefloor filled all night. They played a huge part in making our day such a wonderful experience! We are still being asked where we found the band when we’re talking to our friends! All the best and a massive thank you. I just wanted to say a huge thank you to you and the band, I meant to go up to them on the night but never got the chance to thank them. They were absolutly brilliant, the dancefloor was full all night everybody from my young cousins to my granny’s brother were up dancing, the music was such a great mix. Even the bar man the next day commented on how brilliant they were and how they’d never seen a dance floor fill up from the first song. Everybody truly enjoyed it and can you say a special thank you to the band for letting my granddad get up and sing a song, it meant the world to me to have him do that, something I’ll never forget!! Ill be recommending them to other brides at any chance I get! Just want to say thank you to you and The Best Men Wedding Band for helping us have the perfect wedding day. One of the reasons why we initially chose The Best Men Wedding Band as our wedding band was the prompt and extremely friendly and efficient service we received from you at the beginning of our enquiry which continued all the way through to our wedding day. Along with this the band were amazing and very professional. We are still receiving fantastic reports back from our guests, of which many have commented that they are the best wedding band they have ever experienced. They kept the dance floor full all night along, as did the DJ service also, who had no problem playing any song requests that were asked of him. We are so happy to have chosen them as our wedding band and would thoroughly recommended them to anyone. Its Lorraine and Dan Costigan here. We meant to contact you after the wedding to say thank you very much for making our day very special. Time has just flown by. You were all very professional and really made our day. Thank you very much. We have been and will continue to recommend you for all occasions especially weddings. Thanks you so much for doing such a great job organising and performing the music for our wedding reception. We were delighted with the piano solo, the live band and the DJ, as well as the friendly and professional manner in which everything ran so smoothly on the day. I would recommend you to any of my friends and many people have commented on the quality of music throughout the day. Thanks again. A huge thank you to you and the guys for adding to our perfect wedding day! 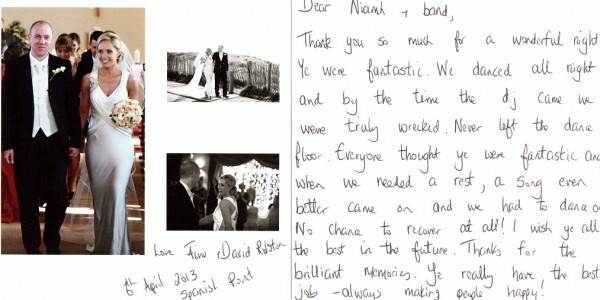 Niamh, you were fantastic to deal with in the run up to the wedding, and you made the whole process so easy for us. When planning a wedding there are so many things that a bride and groom can worry about, but not once did we worry about the band. On the day itself, the guys played our first song to perfection (Tom Baxter’s Better) and no offence to Tom Baxter but I liked your version more! The music you played had everyone of all ages on the dance floor and everyone had such a great time. We have all the pictures to prove it! For any bride & grooms-to-be, honestly don’t hesitate, these guys are brilliant. I’m only getting around to emailing you and the guys now, I don’t know where those last 4 weeks have disappeared too! Geraint and I want to thank the band for a great night in the Hamlet Court on Thursday 16th April. They did a great job entertaining the guests and kept young and old happy. My friend Michelle was so pleased with them she was offering more money for 5 more songs at the end. Sincere apologies to the lead singer for having to listen to her 🙂 !! Thanks aswell for all your help you were so professional to deal with which made it all so easy. We will recommend you to any future bride and grooms we meet. The Best Men Wedding Band played at our wedding in April and were fantastic, they had all our guests of all ages up dancing all night long!! We had the Jazz Duo, the Band & DJ and it worked very well & made it very easy for us to co-ordinate, it was a great idea. We left it up to band to select most of the music except our first song and some last minute requests which were all played for us without any problems. Everyone remarked on what a great band they were. We couldn’t have asked for anymore. Many thanks Niamh for all your help and of course to Jonathan & the lads. We will definitely recommend The Best Men Wedding Band to anyone. We’ll be recommending you to one and all. Just back from honeymoon and just wanted you to pass on our thanks to “The Best Men Wedding Band” for a truly memorable night. They were fantastic musicians and had the dancefloor full all night. Everybody commented on how good the band were and how they were able to judge the people and music perfectly. Most of all we had a great night thanks to the great entertainment. Would recommend to anybody. Thanks to you too for all your help and the ease of organising. We got married in February 2009 in the Mount Wolseley Hotel, Carlow and The Best Men Wedding Band provided a jazz duo for our pre-reception plus the band and dj for the reception. They were absolutely fantastic. They had the dancefloor packed for the entire night and we’ve heard rave reviews from our guests about how brilliant the band were. I was so tired the next day because I didn’t want to leave the dancefloor – the music was just so good. Looking back on our DVD now I see people dancing that would never have danced before. We had a few special requests and the band played every single one of them. Booking with Niamh was a dream. She was so easy to deal with. To all couples out there looking for the perfect wedding band I can highly recommend The Best Men Wedding Band. You’d be mad to get anyone else!! We booked the jazz duo, band and DJ for our wedding in the Dunraven Arms, Adare on the 12th December and as I didn’t get a chance at the end of the night to thank them, I wanted to email to convey our thanks for their really excellent performance. The band made our night – they sounded absolutely brilliant and the mix of music was such that the floor was never empty and most of our guests commented on how great they were. Just a quick note to say thank you to The Best Men Wedding Band for playing at our wedding on the 27th Oct. Helena and I were delighted to have chosen The Best Men Wedding Band and we both agree when we say that they played a blinder! The music was top class, clear, not too loud, perfectly blended and really added to the atmosphere on the day. We’re delighted that we had your band play for all aspects of the reception throughout the night. We’d gladly endorse The Bestmen having received such an excellent service. I wanted to email and say a huge Thank You to you all. Niamh, thanks to you for your professionalism and ease of organisation before the day itself. You were a pleasure to plan with! The music at wedding was just awesome and we were really impressed by what the guys did. Everyone had a ball and many of the guests commented on how brilliant they were. Brad and I were especially grateful to the guys for learning those extra songs for the dances and of course for letting us sing our drunken rendition of ‘Haunted’ with them too. It was brilliant craic. If there’s anywhere you’d like me to write a review I’d be more than happy to give you glowing references. As people say, food and music make a wedding and we certainly lucked out across the board. The Walsh’s here!! Liam and I want to thank you for making sure that booking The Best Men Wedding Band was an easy affair. You were so helpful and professional. At a time where you’re going crazy organising things you made it all so simple, so great thanks to you Niamh!! To Charlie, Aran, Colin and Jonathan, where do we start?? Every one of our guests thanked us for such a wonderful party so in turn we are thanking you! !You guys played every song we love and were so friendly and professional! Thank you for learning ‘Walk The Line’ for us, it meant a great deal to us that we could dance to it as a live version!! Also, I found your pages of the words and notes and will treasure it!! It’s a wonderful keep sake!! Jonathan, you went beyond the call of duty by staying so late and playing the piano til God knows what time!! We cannot thank you enough for this!! It made the end of the night so special!! If you guys need any recommendations please just mail!! We are 100000% happy with every aspect, from dealing with Niamh to dancing along to your great music to singing (screaming) along with Jonathan til the early hours. Thank you so much for everything, The day went fabulous. Everybody has commented on the band and the Jazz duo was a great treat for everyone they are still talking about it. We are so glad that we decided to pick The Best Men Wedding Band as they were very professional, looked really well and sang great. All the best to you and the lads. Once again thanks for everything I would definitely be recommending you to everyone I know. We had our wedding in Moyvalley Hotel and Golf Club on the 8th of May 2008. We were let down by our first band 6 weeks before the wedding and I now believe that everything happens for a reason! The Best Men Wedding Band were by far a better band and they not only met our expections but beyond as well. The Jazz duo at the drinks reception gave a lovely atmosphere and everyone commented on how relaxed it was. The first dance which was Tom Baxter’s song Better, dare I say it, was sung better than the man himself. They really got the crowd going and I can’t recommend them highly enough. Thank you so much for making a special day even more special. Tell the lads thanks a million for singing at our wedding reception last night 18/4/08. They had our guests on the dance floor for the night (I was never off it!!). Everyone were asking who they were -they made the night a great sucess. Myself and Gary had a brillant day (feeling worse for wear today). I know of a couple of weddings next year and we would definitely recommend The Best Men Wedding Band. I just wanted to thank you so much for all your help and advice over the past few months. The Best Men Wedding Band played at our wedding on March 28th in Brook Lodge, they were absolutely fabulous. We had the jazz band at the drinks reception, piano at the meal, the band and then DJ – Everyone commented on how great they were, the dance floor was full for the whole night. I will be recommending them to anyone that is getting married soon. I actually recommended them to the facilities manager in work, and they got them to play in work on Monday. Once again thanks so much, The Best Men Wedding Band really are fantastic! The guys played at my wedding on Nov 9th in Dunboyne Castle. Am just back from honeymoon and I didn’t get the chance at the end of the day to thank all of the guys in the band, so wanted to email you to say how wonderful they were the whole day. They played a brilliant mix of music and were extremely professional. 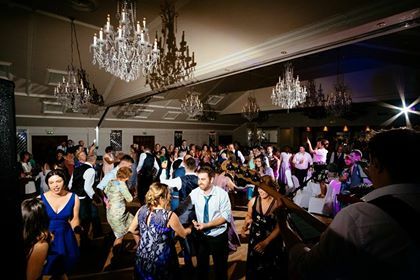 As you’re aware the music at a wedding is extremely important and can leave a lasting impression, well the dance floor was packed all night and so many of our guests had blisters on their feet from dancing and passed on their compliments on the music. The guys were just great. I’ll definitely be recommending you. Mark and I have just returned from honeymoon and all of the wedding plans seems like a distant memory. Just a note of thanks for such a professional job. The Best Men Wedding Band were fantastic. All of guests commented and everyone was up dancing. We had a fantastic night. The Jazz duo were excellent and the DJ kept everyone dancing till late. They really made our day very special. Thanks for helping us with all aspects of the music, and for dealing with our booking so well. The only complaint was that it all went too fast. Thanks to all The Best Men Wedding Band. P.S. I would have no hesitation in recommending The Best Men Wedding Band are an outstanding wedding band! Just a quick note to thank you guys so much for Saturday day and night. The jazz duo and band were really extraordinary and everyone was raving about them. They really made our day and night special. We were absolutely delighted and thrilled with the Best Men Wedding Band, they were a pleasure to deal with and had the dance floor packed all night. The jazz duo were also excellent. Most of our guests commented on how great the band were!!! I dont think i have ever commented on any band that i saw at a wedding!!! Jonathan & the guys were true professionals who read the crowd well and knew exactly what mix to play to keep the dancefloor packed all night. I couldn’t believe it when i saw aunts & uncles, who never graced the dancefloor at other weddings i was at, dancing and having a ball on the dancefloor at our wedding!!! The DJ set was also brill as johnathan included lots of songs i had requested and they seemed to go down well. Without a doubt, I will be highly recommending the Best Men Wedding Band to all my friends and colleagues getting married in the future. In addition to their immense talent, the jazz, band and DJ package which we chose for our wedding was probably, the best decision we made regarding the day itself. I wish you and the guys all the best in the future Niamh, and thank you for being such a pleasure to deal with. Our special day wouldn’t have been the same without the band!! I recently got married in Dublin and held my reception at The Grand Hotel in Malahide. It was a wonderful day and was incredible for my Washington DC born husband to return to Ireland with me with some 40 or so of his family members. Our band and DJ that night were the Best Men Wedding Band Band. And I just wanted to drop you a line to say that they were amazing!….and kept us all, including myself up on the dance floor all night…..(whoever said Brides don’t get the chance to enjoy themselves on their big day obviously never had these guys) I have to say knowing our guests were of mixed generations and backgrounds they catered so well!, a definite fear of mine whilst planning. They were even conscientious enough to have found our “first dance” song, an obscure Dave Matthews’s tune. Niamh, their booking agent was also great to deal with, not knowing what to expect she was a great help. The guys themselves were so nice and very professional on the day, even taking requests from my husband’s family. I would highly recommend them to any new Bride planning her big day. The Best Men Wedding Band played at our wedding recently and they are absolutely brilliant. They are really professional looking and sounding and had everyone swinging on the dance floor. We also booked the Jazz Duo and we loved them – perfect for the drinks reception. 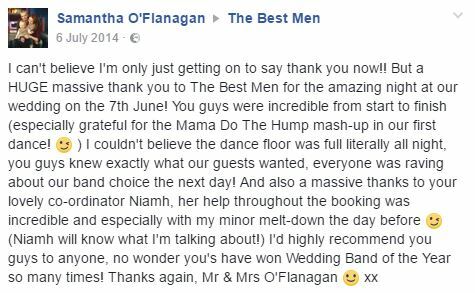 We would highly recommend The Best Men Wedding Band and Niamh, their booking agent, is also a pleasure to deal with and you can trust everything will go smoothly on the night. Just a quick note to thank you, the Jazz duo and the Best Men Wedding Band. Unfortunately I didn’t get to see much of the Jazz Duo due to the Photos but all guests commented on how terrific they were. I did get to hear most of The Best Men Wedding Band who were fantastic and kept everyone on the dance floor. So thanks a million to you all! The Best Men Wedding Band played at our wedding in August and they were absolutely superb, they had all the guests of all ages up dancing all night. We left it up to them to select the music except the first song and they really read the crowd well. Everyone remarked on what a great band they were. Many thanks Niamh for all of your help and of course to the lads, Jenny.